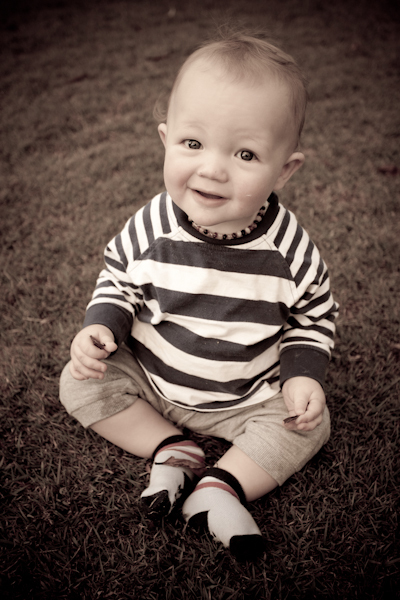 Late December 2010 and January was a very heartbreaking time for Queensland. 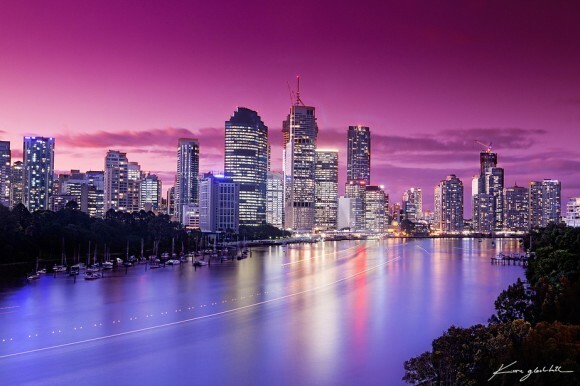 December 2010 ended with a lot of rain to South East Queensland and North Queensland, with two thirds of Queensland being declared a disaster area. 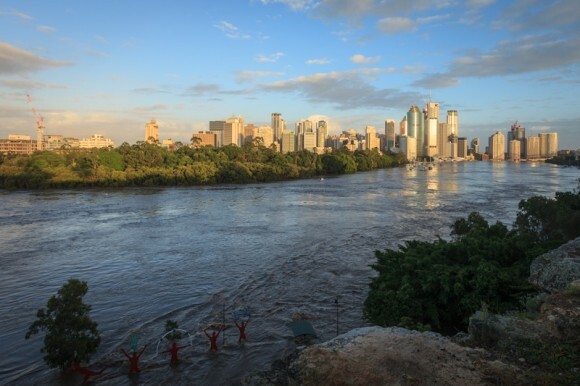 On January 10th, Brisbane and South East Queensland suffered a horrendous flood event. Lives were lost and it was a terrible time for Queensland. However, the community spirit banded together and thousands of volunteers helped others get back on their feet. You can see the red statues at the base of the cliff, the water was waist high. If you look closely you can also see the water is lapping at the base of the city buildings and the botanic gardens is flooded. After the flooding went down I did a quick sunset trip to Beachmere with David Anderson, the tide was high and this is really all I got. 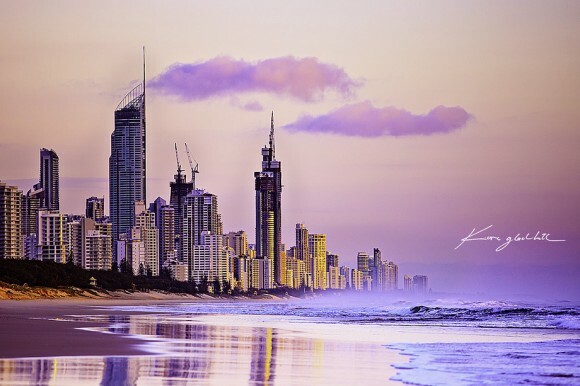 Later in January, in fact during the Australia weekend I spent a few nights down the Gold Coast with family. I went out for dawn on the 26th Jan (Australia Day) and catapulted this image. I loved how the clouds looked like smoke stacks coming from the buildings. Reedy and I woke early in order to travel to Moreton Island on his boat. Half way there the engine started playing up, and we were right in the middle of the shipping channel, anyhow with a stroke of luck the engine kicked back into life and we were on our way again. Moreton Island is an amazing island, the Big Sand hills are located about 1km south of Tangalooma. An image with a different feel. 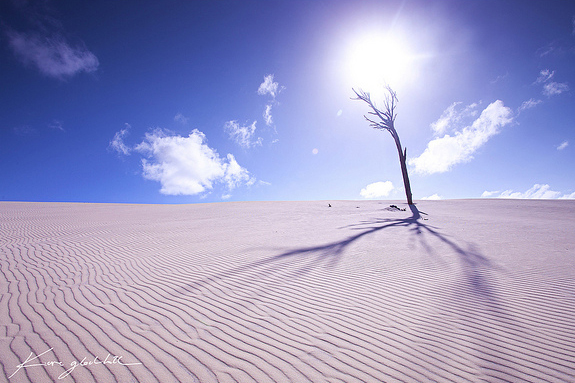 ‘Dune Shadows’ is a simple yet pleasing image. The soft morning light, and the rich fluffy clouds combined with textured shadows in the sand evoke the sense of adventure. By this time in the year, I’d still not captured anything new around the city. The river colour was a dirty brown due to the January flooding and the City Kat ferry service was out of action. I had heard on the news that the first service had restarted earlier that day. I wanted to capture this moment, and I needed to do it in a way was new and different. 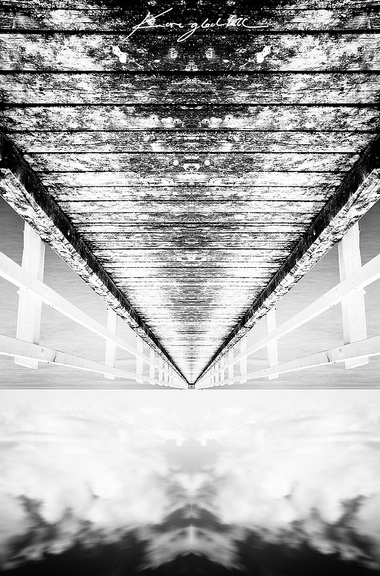 This image is a mask of two images, one exposure for the water and another exposure for the sky. Glass House Mountains is a hinterland town of the Sunshine Coast, Queensland. 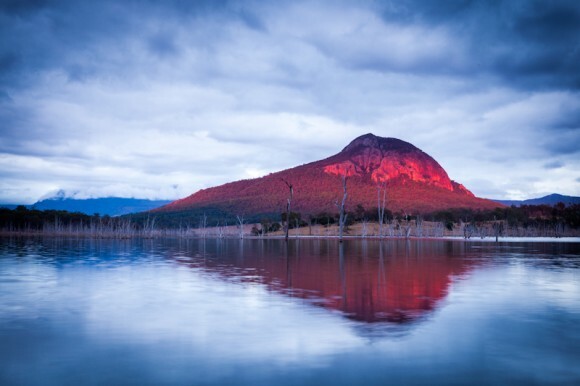 The Glass House Mountains were named by Captain Cook and are fantastic volcanic crags, just 20 kilometres north of Caboolture and approximately 64 kilometers north of Brisbane. Captain James Cook was the first European to view the mountains. The Glass House Mountains is renowned for its natural beauty, the vitality of its farming industry and its numerous tourist attractions. Walking up the track before dawn is hard work -700m steep climb. The view from the top is reward enough. I had a workshop here on this particular morning, and we were greeted to some nice dawn light over the mountains. April is a fun month, as it features a 4 to 5 day weekend! yes Easter. Taken this afternoon at the Roma Street Park Lands Large Scale Meet Up. 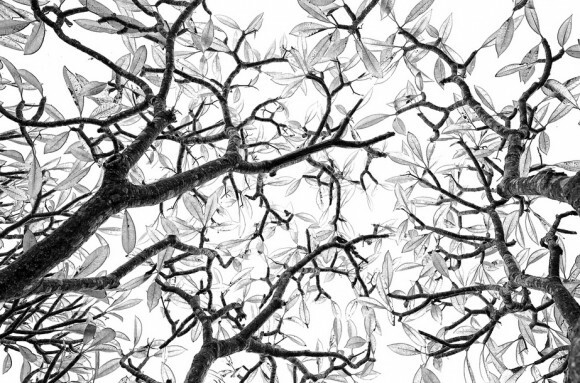 I walked into the picnic area and saw the neat lines and shapes through the Frangaipani trees, I got down low and used the bright over cast sky. I also spent a morning up at Fingal with David Anderson. I thought I managed to snag something a bit different and unique from an over photographed area. May was a slow month for me, I did manage a start trail and some storm clouds, but nothing worth adding. June was also a very slow month for me, my birthday came and went and I managed to get out a few times – on one occasion I took a trip to the inner islands in Moreton Bay and spent some time on the various private jetty’s and piers. Etched in Timber is a bit different from me. July came and went, but I did manage to get out for a few Star-trail workshops with David de Groot. 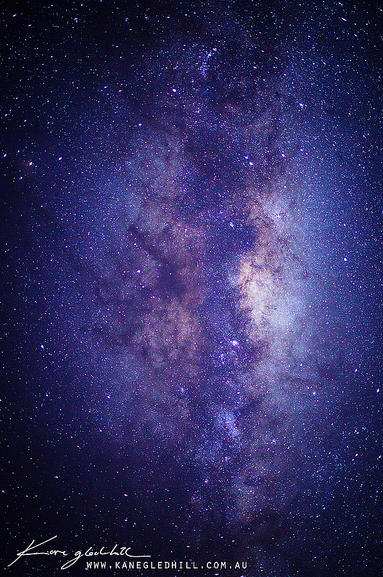 I borrowed his 35 f.14 lens and took this simple but nice star field shot. In August, Matt had an idea of a foggy shot at Lake Moogerah with golden light. We headed out with fog predictions and didn’t expect it be so cloudy – I was quite under-whelmed and ready to head home with no shots. However, for a few minutes suddenly, the lake lit up with some of the most vibrant reds I have every seen – what a sight. River for 2011 came and went, and was OK, but not the same as years gone by, I managed to get a nice shot while teaching a few students on the night. This image is made up of two exposures, one for the bridge and the other for the fireworks. These are then masked together. A few weeks later I headed on a trip back to Tasmania with Matt and Michael – spending a day with David Murphy at Stanley. On this trip we did a strange zigzag trek where we covered 2500kms in about 8 days! Weather was not our friend and we had mixed conditions on most of the days – with overcast days in Arthur River and rain. However, we had a great time with David and he showed us his part of the world twice – and provided us with directions for our next leg of the trip which was Arthur River. 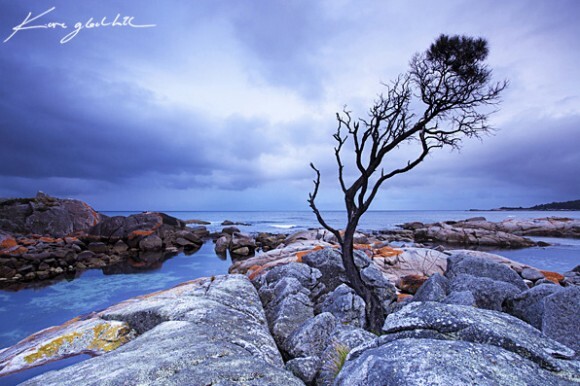 The famous Binalong Bay tree, Bay of Fires, Tasmania. I smashed a Cokin filter minutes before taking this shot. Taken on the first night of our 8 day trip, I was glad we got a few shots before the rain arrived. Arthur River is the name of both a river and a small township on the northern part of the West Coast of Tasmania, Australia. At the 2006 census, Arthur River and the surrounding area had a population of 121. It is south of the town of Marrawah. Named after Sir George Arthur, Lieutenant Governor of Van Diemens Land (1824-36), the river is fed by several tributaries including the Frankland River, which was named after its discoverer, then the colony’s surveyor-general. The region has been exploited commercially for timber and fisheries, but today is mostly a centre for tourism. On the coast near the mouth of the Arthur River is a plaque titled The Edge of the World. North West Coast Tasmania, and a poem by tourism pioneer Brian Inder, who coined the term, referring to the coastline at Arthur River which is regularly lashed by the gales of the Roaring Forties. * The Roaring Forties is the name given to strong westerly winds found in the Southern Hemisphere. 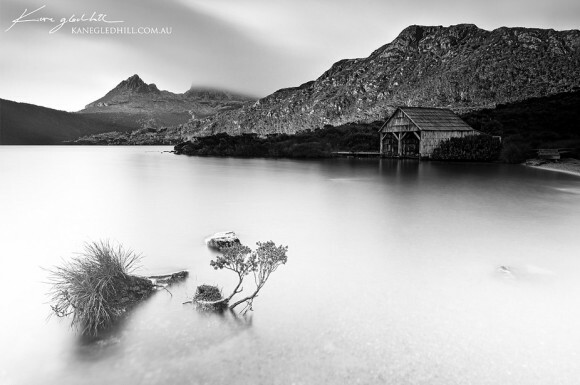 Dove Lake is a corrie lake near Cradle Mountain in Tasmania, Australia. 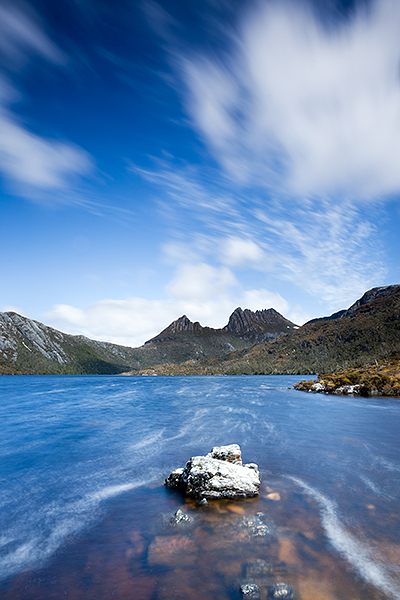 It lies in the Cradle Mountain-Lake St Clair National Park. The lake is a very popular visitor attraction and is encircled by well maintained walking paths which also lead up onto Cradle Mountain. Like several other lakes in the region, Lake Dove was formed by glaciation. The habitat is unique and includes the Tasmanian deciduous beech (Nothofagus gunnii), tussock grasses, snow gums and pencil pines. Among animals wandering the shores of the lake are numerous wombats, echidnas, pademelons and tiger snakes. Sticking out into the sea on Tasmania’s mild east coast is the rugged and beautiful Freycinet Peninsula. Freycinet National Park consists of knuckles of granite mountains all but surrounded by azure bays and white sand beaches. The dramatic peaks of the Hazards welcome you as you enter the park. Freycinet is effectively two eroded blocks of granite – the Hazards and the Mt Graham/Mt Freycinet sections of the peninsula – joined by a sand isthmus. 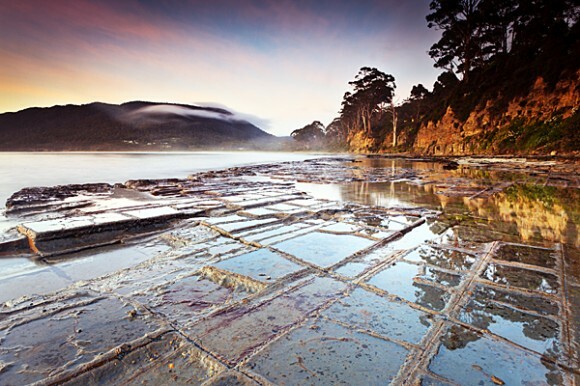 A tessellated pavement is a rare erosional feature formed in flat sedimentary rock formations lying on some ocean shores. The pavement bears this name because the rock has fractured into polygonal blocks that resemble tiles, or tessellations. The cracks (or joints) were formed when the rock fractured through the action of stress on the Earth’s crust and subsequently were modified by sand and wave action.